The final table included Barbara Enright, the only female to ever reach the final nine at a WSOP Main Event. She would eventually bust out in fifth place when her pocket Eights were cracked by Brent Carter’s Six-Three. 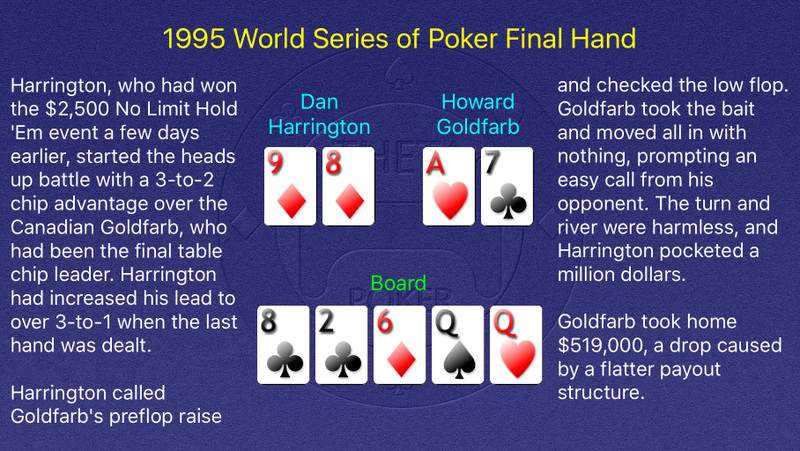 As impressive as it was to win the WSOP Main Event, many people consider Harrington’s back-to-back final tables in 2003 (3rd place) and 2004 (4th place) to be a bigger accomplishment. He also reached the final table in 1987. Goldfarb had placed 22nd in the previous year’s Main Event for his only other WSOP cash.